Trevor Bauer, one of the top pitching prospects in the country, has a very quirky routine that he goes through prior to taking his warm-up pitches before every inning he pitches. He starts behind the mound and takes a hop, skip and a jump over the mound before uncorking a pitch as hard as he can at the other end of the mound. He normally hits the upper 90's on this throw, and then he settles in and takes his warm-up tosses before each inning starts. 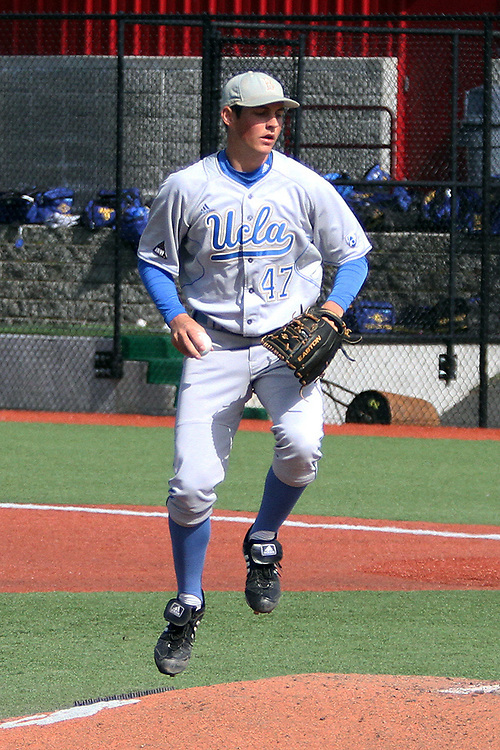 This sequence was taken during the Bruins Pac-10 conference baseball game against Washington State at Bailey-Brayton Field in Pullman, Washington, on April 9, 2011. Bauer pitched a complete game, giving up six hits, striking out 15, while running his record to 6-1 (this is photo number 6 of 16...these photos are only available as 4x6 photo's...for larger photo's, please contact Greg Davis Sports Photography).